Duty of Care – What Should I do with my Business Waste? All businesses are legally required to manage their waste. But recent research suggests that more than half of UK companies do not fully comply with Duty of Care and 94% of those are SMEs. Mostly this is because they don’t know what they need to do. Keep waste documentation correctly. All waste Duty of Care paperwork must be held for a period of two years (three years for hazardous waste). If you don’t use a licensed waste contractor, you risk them simply dumping your waste (fly-tipping) – if this is traced back to you, you are still liable for prosecution, even if you had acted in good faith. 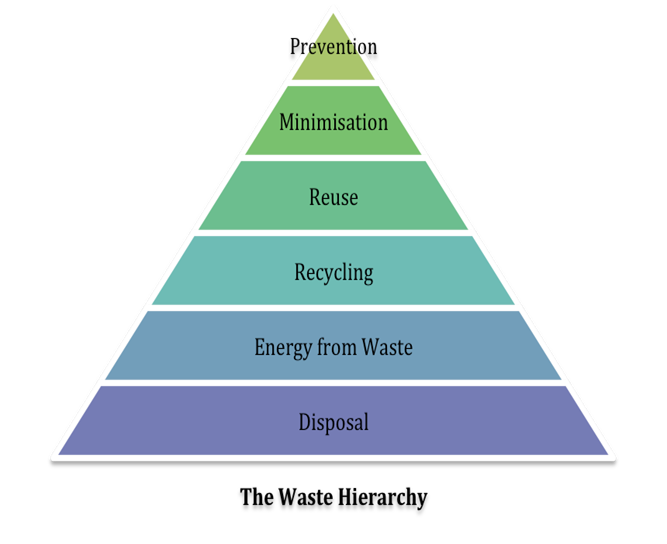 Follow the waste hierarchy, can your waste be…? Re-used – could you sell, donate or swap your unwanted items? Repaired – search for local repair services or contact your local council. Recycled – is it part of your waste contractor’s normal recycling service? If none of these are possible, it needs to be disposed of correctly. Ensure it’s stored and labelled properly so nothing can escape such as litter, liquids or odour. Prevent access to it by others, e.g. in a locked bin or secured compound. For each waste stream, you need to keep the Waste Contract (for regular collections) and/or the Waste transfer notes (WTN) (for ad hoc or one-off collections). Each waste carrier must be licensed. All waste Duty of Care paperwork must be held for a period of two years (three years for hazardous waste).